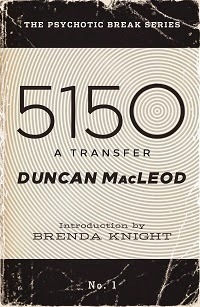 Today we are interviewing Duncan MacLeod, author of the mental health memoir 5150 - A Transfer. I was transplanted from California to Boston for boarding school in the 1980s. When my mental health declined, I dropped out of Columbia University and moved back to San Francisco, which is when this memoir begins. Years later, I still have to deal with mental health issues, but they haven’t stood in the way of my dreams, which include publishing this novel. I earned my MBA from the University of Southern California and now I live in a ranch style house in the San Fernando Valley with my husband, my dog, and a swimming pool. When young, gay Ethan Lloyd comes unglued at a seance, he becomes convinced he has been kidnapped by the phone company and taken to another planet. It turns out to be jail. The transfer from jail to the mental hospital (called a ‘5150’ transfer) appears to Ethan as a rebirth into a new body. As he gradually regains his mental faculties, the reader is released from the intense first person present narrative style and allowed to breathe in the third person past tense. Anyone who wants to know what psychosis is like will benefit from reading this novel. It is aimed at friends, families and loved ones of young teens who are trying to cope with their beloved’s mental state, and want to understand where they are coming from. What inspired you to write a book about a character who experiences psychosis? There is nothing more frightening than losing touch with one’s faculties and ability to reason. Ethan is suffering and frightened, but you will see that he is still in there, despite all the confusion, and he is able to make his way back to reality with the help of a lot of love, medicine, and time. What techniques did you use to relay the psychosis to the reader? First person present tense is the best way to make the reader feel psychotic themselves. The identification is so complete. The narrator is unreliable - telling the reader that things are happening which really are not. That is what psychosis feels like. What made you decide to set the book in 1980s San Francisco? William Burroughs, Allan Ginsberg, Vladimir Nabokov, William Faulkner and anyone else who uses the unreliable narrator. What can readers expect from the next book in the series? The next book, 1/2, is a continuation of Ethan’s recovery, this time moving from the 3/4 of the way house to a halfway house. Along the way, he falls down a new rabbit hole and meets the weavers of his fate in the court of the Faerie Queen. Mental illness is heavily stigmatized, and that is a serious problem. One way to help reduce the stigma is to portray it just as it is, warts and all. The result is often hilarious and heartbreaking in the same moment. There will be five books in this sequence - the “Psychotic Break Series” so if you love this book, get ready for more excitement and madness with Ethan. Sue is older, more experienced, and very cool. She doesn’t have any job ideas for me. But she’s going to a séance at Wanda’s house, do I wanna go? Yeah. Wanda lives just a few blocks away in the Lower Haight. It used to be an all-black neighborhood, but recently some punks moved in, and it’s starting to change. Wanda lives in a pink stucco apartment building with aluminum windows, the only modern building on the block. Sue giggles as we enter Wanda’s house. Wanda is sprawled out on the peach-colored sofa, watching the Prince Special on MTV. Wanda is a beautiful, buxom blond from West-by-God-Virginia who shrieks when we walk in.